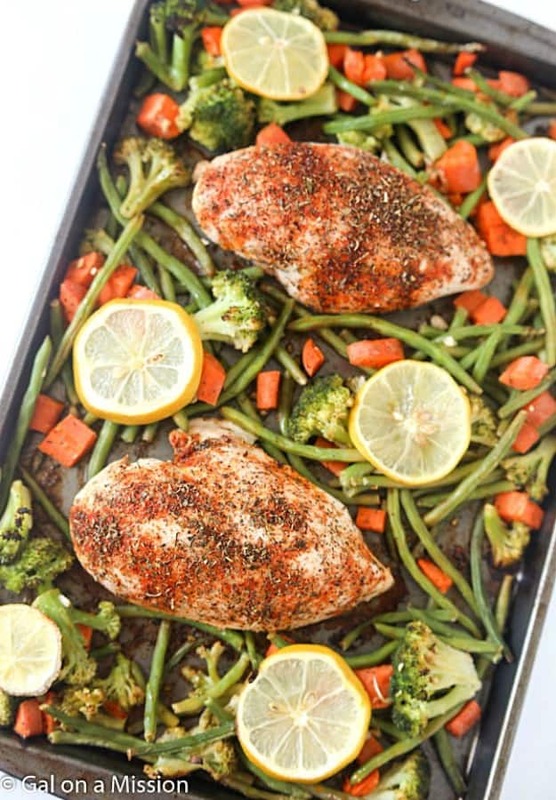 One-Pan Baked Lemon Chicken w/ Vegetables – An easy and healthy weeknight meal! If you are a fan of one-pot meals, you will love this. Some nights I need to have a quick and easy options for dinner. Or I resort to take-out, like Chinese or pizza from the local pizzeria. I’m sure I’m not the only one, especially when you have littles running around begging you, “When’s dinner?” I suspect that was me as a child, too. This past year I have fallen in love with one-pan and one-dish meals. How can you not? They are simple where you add everything to one pan or pot and bake it for a certain amount of time. Hardly any no prep-time is needed for these types of meals. 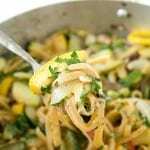 During the summer when the vegetables are thriving in the garden, we have one-pot summer vegetable pasta quite a few times a month. Or even 15-minute one-pot taco pasta, it’s unreal how quickly this dinner comes together! 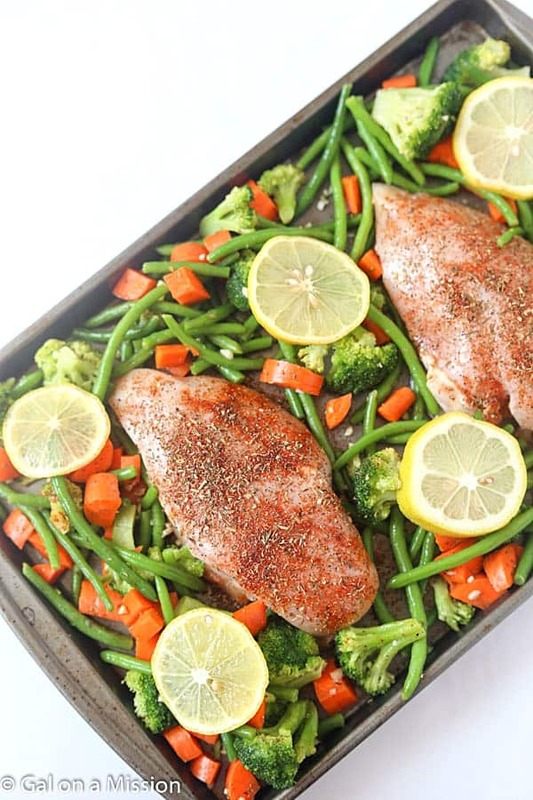 Now this one-pan baked lemon chicken with vegetables is a delicious and healthy meal. It’s not loaded with weird ingredients, just wholesome vegetables and meat. I am a carb-loving gal, but sometimes just delicious meat and vegetables is all I want. Another I absolutely love about this one-pan meal, you can add any kind of vegetables you may have on hand. You can use fresh or frozen vegetables, as well. I used frozen broccoli and green beans. I always pick up a big bag at our local warehouse store, BJ’s. For the baking sheet, I highly recommend a medium-to-large one, like this half-sheet pan. I use mine for anything and everything. Definitely a kitchen gadget worth investing in. Preheat oven to 400 degrees. Grease a half-sheet baking sheet with non-stick cooking spray or cover with aluminum foil. Set aside. Juice half a lemon over the chicken breasts. Slice the other lemon into slices. Mix together salt, pepper, paprika, oregano, basil, and thyme in a small bowl. 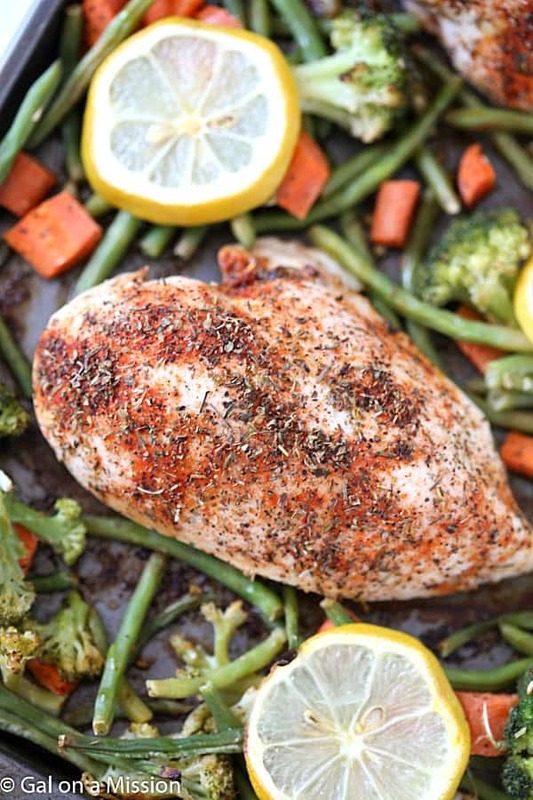 Coat the chicken breasts with the spice blend. Add the vegetables to the half-sheet baking pan and coat with olive oil and season with salt and pepper. Add the chicken breasts on top of the vegetables. Bake for 40 minutes or until the chicken breasts are done and the vegetables are tender. Tried your recipe and it was really good. 🙂 Thanks! My family loved it.